Each year I calculate my portfolio’s overall rate of return and compare it to an appropriate benchmark. Whether you’re a stock picker or an indexer, I think this is an important exercise to make sure you’re not getting worse results than a dead-simple indexing strategy. Even indexers get the benefit of making sure their portfolios don’t have any hidden leaks. My family’s returns still don’t exactly match the benchmark because my wife still holds a small amount of Berkshire Hathaway stock. She’s slowly selling it off each year to spread out the capital gains income. This year our total portfolio earned a 7.63% return. Because I measure my returns in Canadian dollars, this year’s return benefited from the drop in the Canadian dollar relative to the U.S. dollar. So, Canadian stocks performed poorly, but U.S. stocks performed well (in Canadian dollars). When you’re well-diversified, there are always parts of your portfolio performing well and other parts poorly. I underperformed my benchmark by nearly 1% this year. This is because Berkshire Hathaway underperformed. Despite my respect for Warren Buffett and Charlie Munger, I’m looking forward to selling the last shares of any individual stock my wife and I own. Looking over my history, you’ll note the unbelievably good 1999. That 192% is not a misprint. Over the entire period my compound average return beat the benchmark by 3.24%. But if we eliminate 1999, I lose to the benchmark by 1.00%. One huge piece of luck made up for a lot of mediocrity. I consider the period from 2000-2009 where I frittered away much of 1999 gains to be what I should expect if I take up stock picking again. That’s why I’ve been an indexer for about 6 years now. I’m happy to have been lucky, but I’m not taking any more foolish chances. Every stock-picker needs to make a choice. If returns matter more than your ego, then you should compare your returns to a benchmark. If protecting your investing ego is more important to you than returns, then keep your head firmly planted in the sand. I would bet your numbers are more honest than many of the mutual funds I am reading about in my yearly fund reports. @Big Cajun Man: You're right. I don't just close down my portfolio and start a new one if I have a bad couple of years. Another very informative post MJ. This post illustrates why I too am happy to be an indexer. @Marko: I'm glad it's working for you. For me, a big part of the advantage is freeing up time that I used to spend studying companies. It also illustrates how returns effect your wealth depending on when they happen. Your 192% return at the start of your investing lifetime has a much different effect than if it had occurred at the end. Young people starting today should be a bit happy with a decade or two of low yields and depressed markets which allows them to accumulate more assets heading into hopefully a growth environment (i.e. higher returns on a larger sum). @SST: For the Berkshire Hathaway stock, I use the ETF VTV as a benchmark. Apart from that, I just use VCN, VTI, VBR, and VXUS as their own benchmarks. So, once I've sold off all the BRK, I won't bother with benchmarks other than to make sure that the individual ETF returns are consistent with their indexes. it's interesting to me that you became an index investor after your very strong performance in 2009. I would've thought you had reached your breaking point after 2007. Maybe it was the volatility that broke you, and concurrently learning about the benefits of indexing? @Gene: I had been reading about the benefits of indexing for years but didn't pull the trigger in a big way until early in 2010. I don't recall any feeling of some event that broke me. I just thought about it rationally. I can get emotional about trivial things like winning a ball game, but for important stuff I've always tended to stop and think. I've heard other people say that during big exams their ears buzz and they can't think. In important exams I always felt like I entered a heightened state where I could think better and faster. In any case, I was (and am) convinced that my results were random and that whether I'd had a good or bad year made no difference to what I should do going forward. This is similar to making a bet in poker and deciding later it was a bad play even though I won the pot. I know that many people just jump from one investing strategy to another each time they get poor returns (that break them), but I'm not like that. Reminds me of how my fantasy hockey league can drive me nuts, but a market decline doesn't phase me. 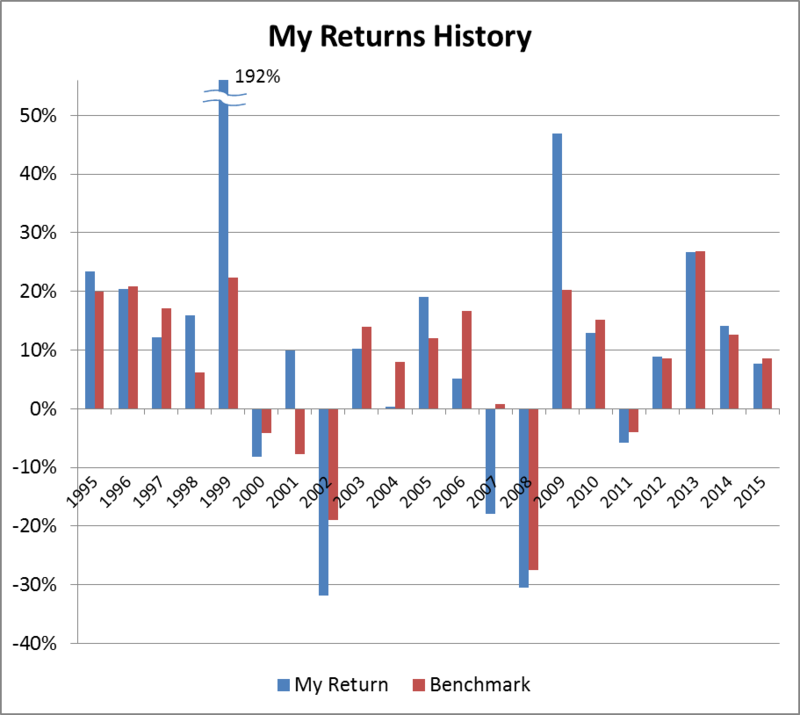 I always compare my returns to the broader market to see how I'm doing compared to average. I've noticed that US investments do well in C$ terms whenever our economy tanks. Amazing to see the C$ back to $0.70 US. Hello inflation! @Gene: You're one of a small minority who compare their stock-picking returns to an index. I'm not too worried about inflation because higher prices means the businesses I own will have higher revenues. It's bondholders who would suffer. @BHCh: For the annual returns I calculate the Internal Rate of Return (IRR). For the discussions of performance over multiple years, I compute average compound returns from the annual returns (which is the same as CAGR as most people define it). Michael, what would be typical "average compound return" over the last ~15 years - assuming relatively constant rate of investment? @BHCh: There's no single answer to that question -- it depends on the asset allocation. But for my benchmark portfolio, the average compound return over the past 15 years has been 4.63%/year. @Michael - thanks. Seems a bit low, particularly once inflation is taken into account... Not much of a reward for all the risk. Mine is showing 7.43% right now; although it's been going south lately. I just happened to be reading this again, and I agree that 4.63%/year for the last 15 years seems low. 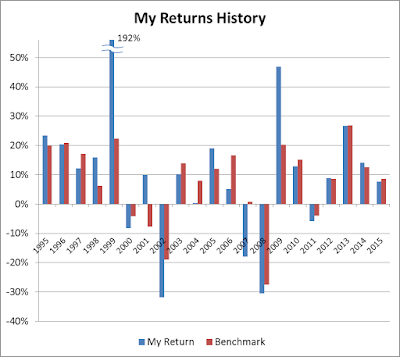 That is actually the compounded annual _real_ return of my benchmark from 2001 to 2015. The nominal figure is 6.6%. Love the last paragraph, Michael. That really nails it! @Grant: Glad you liked it. It certainly felt good to write. How Should New Investors Enter the Market?